The most popular TARA Paper Recycling Technology TARA PaperMek – V for Institutions caters to the requirement of the customer to produce diverse quality of paper that can be used within the institution and for local markets. The range of end-use applications includes writing quality paper, card paper, files and folders for office use. This unit is capable of producing upto 7500 Kg of finished paper. The capacity for recycling can be enhanced incrementally. High quality writing paper can be produced by adding a TARA Hollander Beater. TARA Beater 2 Kg/charge TARA Beater manufactured with high quality stainless steel is used for preparation of pulp with input of cotton rags, denim cuttings, jute and other cellulosic fibers. TARA Calendering Machine 20", width of rolls The TARA Calendaring Machines is used for cold polishing of the dried sheets of paper by placing individual sheets within Galvanized Iron or Zinc sheets. The machine is fitted with electronic safety devices. 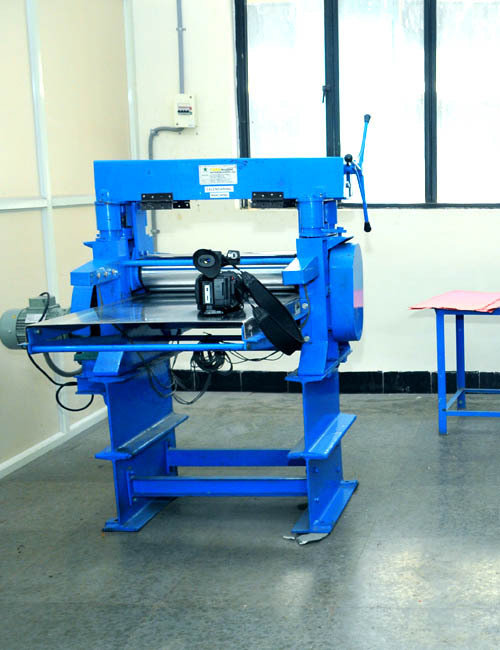 Cutting Machine	 18" Manual Cutter The TARA Manual cutting Machine is used to cut sheets into desired sizes. Why should you choose TARA PaperMek® - V ?